THE IDEA OF FOOTLOOSE industries has changed along with the transformation from an industrial to a postindustrial economy. The core concept remains the same, however: A footloose industry does not have a strong locational preference because the resources, production skills, and consumers on which it depends can be found in numerous places. Such a company may therefore be more prone to relocation, hence the term footloose. 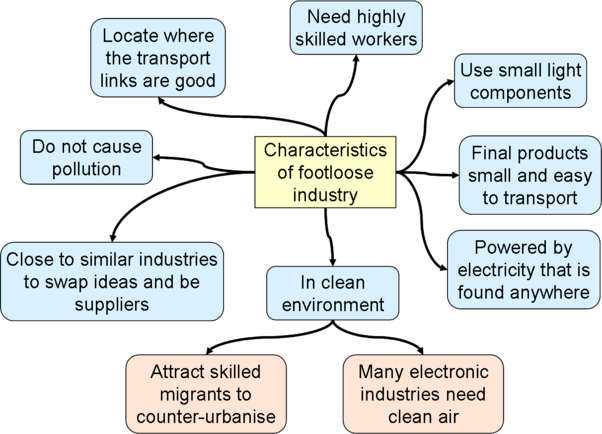 Footloose industries became prevalent in geographic parlance during the quantitative approach in geography from the 1950s onward. Economic geographers interested in industrial location borrowed ideas and methodology from neo-classical economics. The basic premises of footloose industries are derived from the work of German economist Alfred Weber, who was probably the first to theorize on the location of industries in the beginning of the 20th century. First, we must assume that the most important factor in industrial location is the cost of transportation (however, this is less and less true over time). Some industries may have a strong resource orientation, that is, if the raw material used in a production process is heavy and bulky in character, it makes sense to be located close to those natural resources. Heavy manufacturing districts around the world (e.g., the steel industry in northeastern United States) are usually located near major coal deposits. Such a resource-oriented location is often combined with good access to important transportation routes. Other types of manufacturing can be market-oriented. (Traditionally, the footloose concept has been applied in manufacturing, once the dominant sector in the economy.) Let’s take the example of a dairy. If we assume that cows can graze just about anywhere and that milk is a perishable commodity, dairy production should be located close to the consumers the industry serves. For both resource and market orientation, the locational choices of industries are limited, or dressed in more theoretical language, and the so-called spatial margins to profitability are narrow. The opposite is true for a footloose industry. If raw material is easily accessible in numerous locations, markets are dispersed, and the physical properties of the commodity are such that transportation cost makes up a small portion of total cost, the locational choice is much greater. The locational logic described so far has become less powerful over time for a couple of reasons. Relative transportation costs have declined, which in effect expands the spatial margins to profitability for an increasing number of industries. Moreover, the contemporary postindustrial economy is more and more characterized by flow of information and people rather than bulky goods, which has made traditional transportation cost-based location analysis less relevant. The Internet and other forms of advanced communication technology are said to make location completely detached from both resource and market considerations. The growth of footloose industries has some strong implications. Cities and regions that once occupied a relatively secure position in the national and global economy because they harbored few industries that could be characterized as footloose are now thrust into an economic environment that is much more insecure. Capital is more mobile where both existing industries relocate and new investment flows to previously bypassed areas. To cope with this reality, local governments increasingly offer incentives to lure footloose industries. Such incentives include tax subsidies, land to build on, and infrastructure accommodations. Not to be outcompeted by their neighbors, other cities answer with similar measures, which have brought an era of unparalleled interurban competition. As cities are more dependent on the capacity to capture mobile capital, urban policy has inevitably been more businessfriendly, and business interests have strengthened their position in urban governance. Cities are even spending significant money to present themselves as good locations for footloose industries by marketing and advertising. But as cities often offer similar economic incentive packages, location decisions may be determined by other factors. Footloose industries are more likely to locate in places with a perceived high quality of life (i.e., cultural, recreational, climate, educational amenities), where a productive workforce can be attracted. On the other hand, the idea that relocating companies always look for the lowest-cost location has been challenged. For several reasons, industries may not be as footloose as sometimes portrayed. They usually have significant investments in physical infrastructure, they are dependent on local skills and capacities that have been built up over time, and they may share resources and support services with other companies. The hightech industry is sometimes considered a typical footloose industry because it is neither resource- or market-oriented. However, it tends to cluster for some of the above reasons and thus is not a good example of a contemporary footloose industry. A city’s strategy is usually not to attract the most footloose of industries, because they often also produce the lowest-paying jobs. However, the situation is different from a global perspective. With the globalization of the economy, the spatial margins to profitability have widened to encompass large areas of the world. Particularly in industries that are labor intensive, where the products have high value per weight unit, and free trade is the norm, the propensity to frequently seek out new production sites is strong. The clothing industry, for example, is such a footloose industry that has developed a truly global pattern. If companies have the option to outsource much of their production, labor relations are also altered, circumscribing the bargaining position of labor in the United States and other developed nations.